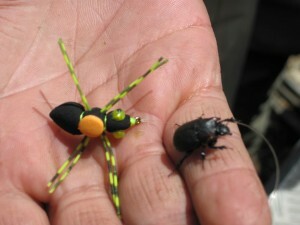 Beetles are a staple in the diet of Brown Trout in Chile. Fished in the timber, or up close to rock bluffs, they proved to be deadly during our trip last month. I added some color to my pattern just as a visual aid but almost any black foam beetle pattern would work. It was amazing how slowly the fish swam up to the fly and just leisurely opened their mouth for the take. It was difficult to find the patience to let the fish take the fly and turn before lifting the rod; but what a fun and exciting way to fly fish! I know one thing, I am going to fish more terrestrials on my home waters this summer. Still having a little trouble with the website getting photos to post to the Gallery section but hopefully we will have that fixed shortly and get all the photos posted. 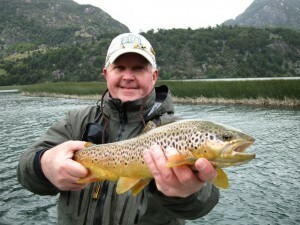 We have several more blog posts on our Chile trip that will posted in the near future. Also we a working on some videos which is new adventure for us that is proving to be a lot of fun. Hope to incorporate some of the videos in the Caddis Reports in the future.